Yuan Chin Ent. Co., Ltd is one of the leading companies in Electrical Switches industry with its high quality and competitive price. 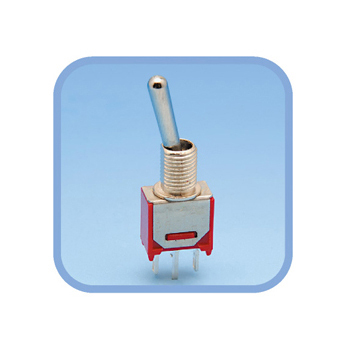 We provide Miniature Toggle Switch, Electrical Toggle Switches, Toggle Switch and so on. Our goal is to provide customers products of high quality, competitive price, and superior services. Toggle switches typically provide a manually accessible member which has metastability in a first position and a second position. A toggle switch includes a toggle lever that is mounted to a cover or housing so as to pivot about an axis or the like. A spring is placed in contact with the toggle lever to exert a biasing force to maintain the toggle lever in one or more stable positions, in addition to maintaining or assisting in the maintenance of a force on electrical contacts that are being switched into contact. Yuan Chin is specialized in manufacturing Toggle Switch and Miniature Toggle Switch for many years. We constantly improve our techniques and upgrade technology to provide the best product to our customers. CONTACT RATING: Dependent upon contact material View More Details . ELECTRICAL LIFE: 30,000 make-and -break cycles at full load. CONTACT RESISTANCE: 20m max. initial @2-4 VDC. 100mA for both silver and gold plated contacts. DIELETRIC STRENGTH: 1,000 V RMS min. @ sea level. OPERATING TEMPERATURE: -30oC to 130oC. SWITCH SUPPORT: Brass, tin plated. TERMINAL/CONTACT: Silver or gold plated. View More Details . Yuan Chin Ent. Co., Ltd. has been specialized in Electrical Switches for almost 20 years. With 19-year experiences manufacturing Electric Switches, we provide Toggle Switches, Rocker Switches and Waterproof Switches, etc, all with durable and superior quality. Providing quality product, promptly delivery and globalization is our prime principle. If you have any doubts about Pushbutton Switch, Slide Switch and Power Switches, please do not hesitate to contact us.